I spied these little boxes in the frozen food case. They were pricey, but tempted me with their lovely shapes and flavors. I bought the pumpkin and the lemon. They had a few more tempting flavors as well. They took about 2 hours to thaw, and looked just like the photos on the boxes. I sliced them in half so I could properly sample the treats. The cake parts were very flavorful and moist. The center was a buttercream that was too plentiful and a little too sweet for my tastes. I would enjoy them more with half of the filling. 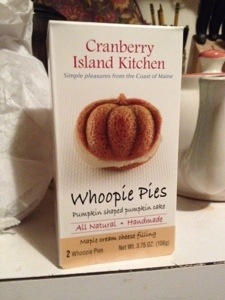 Check their web site, they are a lovely company in Maine. 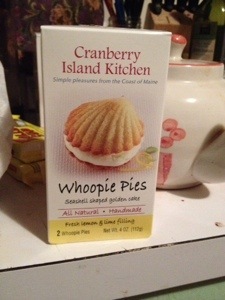 Posted in candy crafts, internet treats, pumpkin, sweet makers and tagged whoopie pies. Bookmark the permalink.